Breakthrough nanotechnology research on self-cleaning textiles by scientists at RMIT University in Melbourne, Australia, could help people to clean their clothes with a spot of sunshine. Close-up of the nanostructures grown on cotton textiles by RMIT University researchers. Image magnified 150,000 times. (credit: RMIT University). An inexpensive and efficient method has been developed by the researchers that enables the growth of special nanostructures, capable of degrading organic matter upon light exposure onto textiles directly. 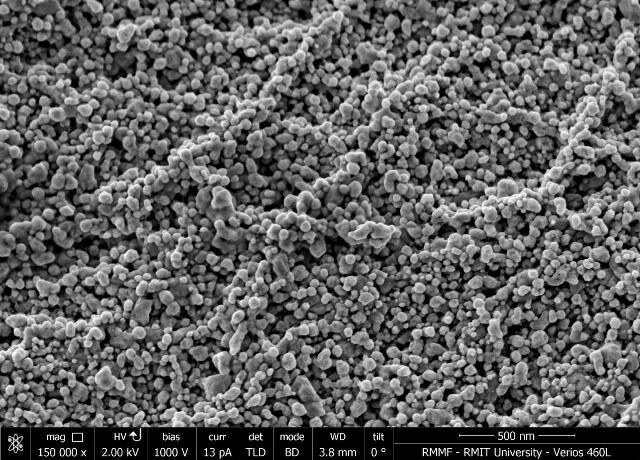 The research holds potential for the development of nano-enhanced textiles capable of cleaning stains and grime by themselves, when they are exposed to the sun or a light bulb. According to Dr Rajesh Ramanathan, the process devised by the researchers had a range of applications for catalysis-based industries, including natural products, pharmaceuticals, and agrochemicals. Scaling up the process to industrial levels is also possible, he added. The advantage of textiles is they already have a 3D structure so they are great at absorbing light, which in turn speeds up the process of degrading organic matter. There's more work to do to before we can start throwing out our washing machines, but this advance lays a strong foundation for the future development of fully self-cleaning textiles. The researchers from the Ian Potter NanoBioSensing Facility and NanoBiotechnology Research Lab at RMIT used silver- and copper-based nanostructures, which are recognized for their capability to absorb visible light. The exposure of the nanostructures to light generates “hot electrons” subsequent to the receipt of an energy boost. The "hot electrons" emit a burst of energy that makes the nanostructures break down the organic matter. Commercializing the concept is a major challenge for the researchers, as they need to figure out how these nanostructures can be built on an industrial scale and made to be attached to textiles permanently. The innovative method enabled the direct growth of the nanostructures onto the textiles by immersing them into a few solutions. Using this approach, stable nanostructures were grown within 30 minutes. The nano-enhanced textiles took below six minutes to spontaneously clean stains and grime by themselves subsequent to light exposure. Our next step will be to test our nano-enhanced textiles with organic compounds that could be more relevant to consumers, to see how quickly they can handle common stains like tomato sauce or wine. The study results have been reported in the Advanced Materials Interfaces journal.